1. 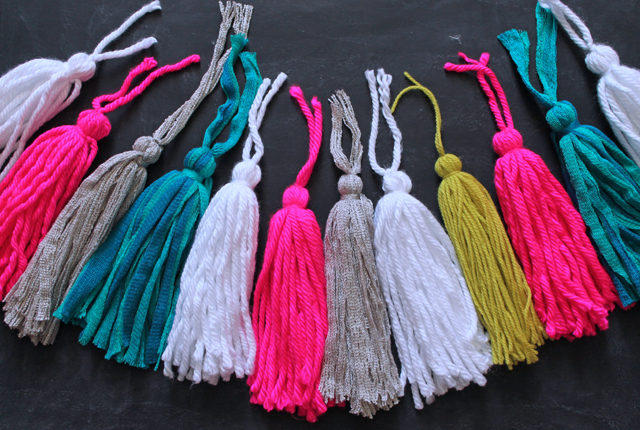 Yarn Tassels: Kicking off the rather yarn themed craft ideas in this post, we have these lovely and very simple tassels. The tutorial for how to make them is over at My Sisters Suitcase (it’s a lovely blog with some other great craft ideas you can check out if you want to). They’ve used these by attaching the tassels to the edge of a bed but you could use them for so many different things. Your curtains need jazzing up? Done. You’ve got a cushion that could use some added fun? Perfect. Maybe even a drab lampshade that would benefit from some fun yarn tassels. The possibilities are endless. 2. Macrame Yarn Garland: The only thing you need to make this one is yarn. Lots of yarn. In any or all the colours you want, you can customise it to however you want it to look. This is from A Beautiful Mess and I might be doing this myself soon as I moving to a rented property and this will be just the thing to brighten up my new room without having to paint the walls. 3. Paper Gift Bag: I saw this tutorial over on hello sandwich which you should definitely check out. 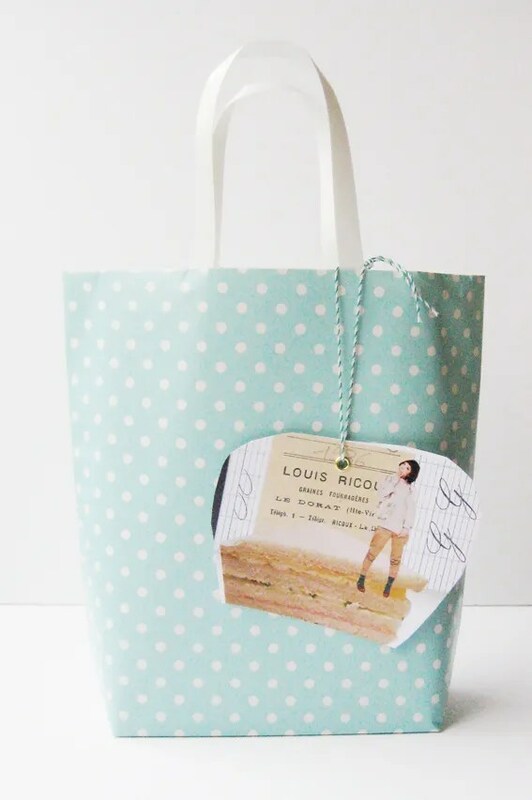 It shows you in easy steps with very clear photographs how to change wrapping paper (or a stronger paper if the gift is heavy) into gift bags. It doesn’t show you how to make handles, it suggests you buy some ready made ones from a shop, but I’m sure you could experiment with making your own. 4. PomPom Rug: This little gem is one of the ones that does need something bought in before you make it but its such a simple and lovely idea that I’m including it anyway. You can find the tutorial for this over at Say Yes. And you can find the rug canvas base at lots of craft stores, and depending on how big you want to make your rug, for as little as £10. 1. Beaded Roses: These showed up on my feed last week from Life is Bello and I just had to share them when I saw how easy and well explained they were. 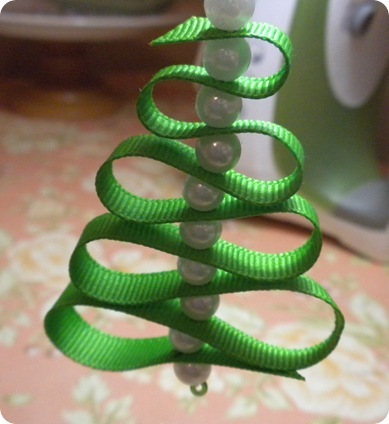 So, okay you are going to need a couple of things before you can do them which isn’t what I normally pick for these quick crafts posts but they really are lovely and once you have the supplies you can make loads and loads of beautiful beaded roses! There are loads of different ways to make paper flower explained out there all over the web, but I think these are my favourite ones. You can use plain or patterned paper to make them and they’re a lot more substantial than some of the tissue paper ones that you find. 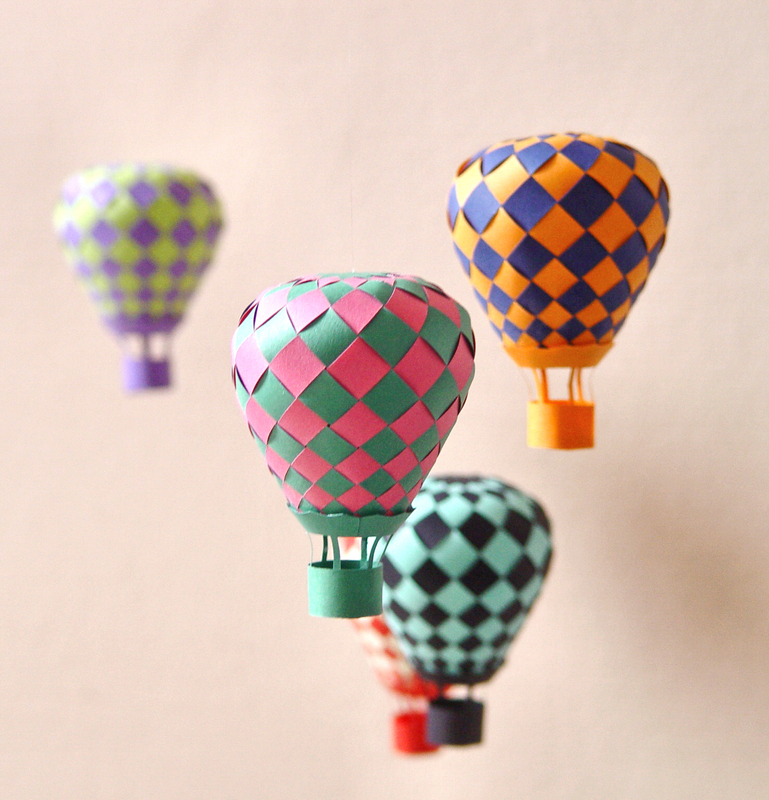 I found the tutorial for these paper flowers over on PaperVine. I think these whacky little owls are brilliant. All you need is the inside of toilet paper and some paints or permanent markers. I found these little chaps on this site. Its all in spanish but the idea is pretty simple colour the roll whatever colour you want then fold over the tops to make the ‘ears’ and draw your lovely owls on. It feels like its been a while since my last quick crafts post, but if you want more ideas and inspiration more frequently you should check out my Pinterest, I pin lots of crafts that can be done easily and also just some inspiring colourful lovelies too. But i’ll continue to do some round ups here as Pinterest isn’t the only place I grab ideas from. Initially, I saw these cute little things over on Running Amok with an Ax. She’s made some lovely ones that you can see in the link. But I think the image that she got inspired by was over on CraftandFun. Their website is in Portuguese, but has some nice ideas and examples, including the image I’m using here. Basically, you get some yarn and some buttons that have a large enough hole in to fit a small crochet hook and have a play. These amazing things are over at PaperMatrix. If you click on the link they have the printable design for you to cut out on paper of your choice, they also have a video tutorial but I recommend having it printed and cut in front of you while you watch it. This is probably the most complicated ‘Quick Craft’ I have linked but they have lots of other woven paper crafts on their blog as well, from hearts, to pinecones and loads of different cool shapes that are easier. These were just my favourite ones. A round up of some free craft tutorials and patterns I’ve found from around the web that don’t take forever and can be done with relative ease. 1. T-shirt yarn: If like me, you’ve always wondered how people make one long strip of yarn from a tshirt, then here is the answer. The tutorial can seem a bit long and daunting but once you get to the bit about cutting you’ll find that its actually quite simple. And once you’ve learnt it, you’ll find yourself drowning in balls of recycled tshirt yarn. 2. Paper Owl : These cute little owls have been designed over at 3eyedbear (just click on the picture on their website to get the pattern). No special supplies needed, just a printer, normal paper, a pair of scissors and some glue. All you need to do is print, cut, fold and stick together. If owls aren’t your thing, then there are plenty of other patterns to choose from (my favourite has to be the parrots). And all of the patterns on this website are designed to be able to complete within an hour. 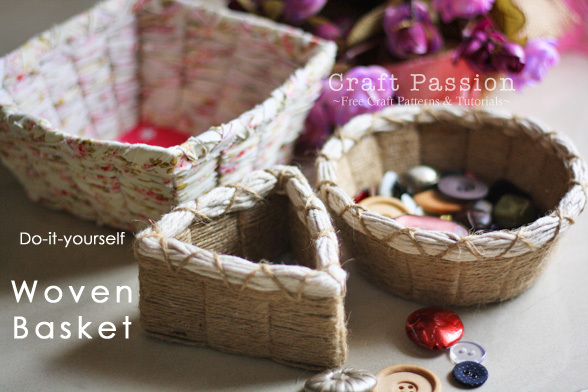 It’s a great starting place if you want to do something crafty on short notice. 3. Cross Stitch Notebooks: This is a lovely and simple cross stitch idea for jazzing up paper notebooks, bookmarks or maybe a nice special occasion card. The tutorial is in Spanish, but with the many pictures (and maybe some added Google translate}, I think this is a great idea for beginners and avid cross stitchers alike that could look stunning. 4. Felt Rose: This pattern is in Portuguese but the pictures in the tutorial that Gracinhas Artesanto has made are pretty self explanatory. You’ll need some felt in green and whatever rose colour you want to create, some scissors, glue and a needle and thread.